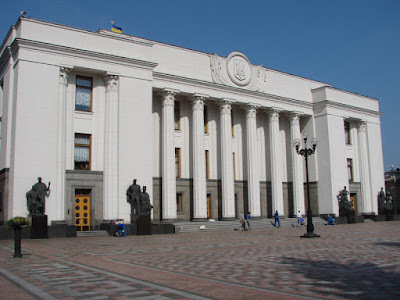 KIEV, Ukraine -- On March 20, the Ukrainian parliament voted to accept a report by its Temporary Investigative Commission that looked into the January 2009 gas contract signed by Prime Ministers Yulia Tymoshenko and Vladimir Putin. The report claimed that Tymoshenko was blackmailed by Russia into accepting gas prices that were disadvantageous to Ukraine because United Energy Systems, which she ran in the mid-1990s, owed Russia $400 million. Bizarrely, on the same day the Ukrainian parliament issued a lengthy resolution calling on the EU to “demonstrate political will and ensure the speedy signing of the association agreement between Ukraine and the EU”. Earlier this month, President Viktor Yanukovych issued detailed instructions “On the working out and affirmation of plans toward the integration of Ukraine to the European Union in 2012”. During an official meeting in Germany, the head of the Presidential Administration’s department on international relations, Andriy Honcharuk, said that European integration remains Ukraine’s main foreign policy goal. “Our main aim in 2012 is the signing of the Association Agreement with the European Union,” he said. “Ukraine sees its future in the European Union. 2011 was a constructive year for Ukraine’s European integration. Membership of the European Union is the basis for the democratic development of Ukraine, improvement of its economy, personal freedoms and well-being of every citizen”. To prove their case, the Party of Regions has launched and is financing the European Centre for a Modern Ukraine (ECMU) in Brussels. The ECMU board includes three Party of Regions deputies and three Western Europeans with links to the Socialist political group in the European Parliament. In 2010, the Party of Regions signed a cooperation agreement with the Socialist political group and the main lobbyist was Ion Iliescu, a Romanian MEP. Since summer 2011, cooperation has waned and the Socialist Group refused to send greetings to the Party of Regions March congress. Today, Viktor Yanukovych’s party has no ties with European or North American political parties and the greetings to its March congress that it did receive were indicative of how bad the Party of Regions’ reputation is. The only greetings that were sent were from the Bulgarian Socialist Party, the Communist Party of China, the Communist Party of the Socialist Republic of Vietnam, the Political Council of the ruling Azeri Party “Yeni Azerbaijan,” the United Russia party, and from Gagik Tsarukyan, the oligarchic leader of the “Prosperous Armenia” party. The greetings are a better reflection of the reality facing President Yanukovych and the Party of Regions than its statements, presidential instructions and parliamentary resolutions. In an interview with the news outlet Den, the Czech Ambassador to Ukraine Ivan Pochukh said that: “it is necessary to tell Ukrainian citizens that the process of the completion of the Association Agreement and Free Trade Zone have been curtailed”. “The question stands as follows: can Ukraine return to the path of European integration, or will Ukraine be stuck on what is its de facto departure from the path of European integration?”. On March 4, Bildt, William Hague, Karel Schwarzenberg, Radoslaw Sikorski and Guido Westerwelle, the foreign ministers of Sweden, Britain, the Czech Republic, Poland and Germany, signed a joint opinion article in The New York Times that lambasted democratic regression in Ukraine. They said, “Today, however, we are at an impasse in the association process. While negotiations on the association agreement were successfully concluded in December 2011, the way forward – through signing and ratification of the agreement – has in effect been blocked by Ukraine’s actions”. The response from Ukraine’s Minister for Foreign Affairs Kostyantyn Gryshchenko was published in The New York Times on March 20, not coincidentally the same day as parliament voted on the temporary commission report into the 2009 gas contract that denounced Tymoshenko’s “treason”. His statement blatantly contradicted European and American government opinions of Ukraine’s recent track record, as well as that of international organizations and human rights groups. With such a dialogue of the deaf, it is highly surprising that some seasoned US and European diplomats and ex-Ambassadors to Ukraine were saying right up until summer 2011 that the Yanukovych administration was listening to Western criticism. Former US Ambassadors to Ukraine Steven Pifer and William Taylor were willing to believe that: “If President Yanukovych is committed to European integration and EU membership, his administration’s domestic actions make achieving that goal much tougher. Yanukovych declares, like former President Leonid Kuchma, that he seeks EU membership. But this declaration means little if the political culture underpinning his administration seeks a monopoly of power at home and builds an authoritarian system. Until the summer of 2011, Western policymakers mistakenly took at face value Yanukovych’s and Gryshchenko’s pro-European rhetoric, similar to that quoted above, when they should have been highly skeptical. Firstly, the EU will initial the Association Agreement on March 30, a technical step that signals the end of negotiations and which should have taken place at the December 2011 EU-Ukraine summit in Kiev. The EU has stated, as quoted above, that the next two steps will not take place until Kiev no longer undertakes a selective use of justice against the political opposition. These next two steps are the signing of the Association Agreement by the European Council (EC) and the EC’s recommendation for ratification to the European parliament and EU member state national parliaments. Secondly, the EU has stated it will not recognize Ukraine’s October parliamentary elections as having been undertaken in accordance with democratic standards if opposition leaders are in jail and not permitted to participate in them. In such a situation, visa black lists and sanctions could follow in 2013 – the same year Ukraine is set to hold the rotating chairmanship of the OSCE. This year Ukraine has to cover or rollover $6 billion in external and $3 billion in domestic debt obligations. Yanukovych cannot fulfill the EU’s demand and release Tymoshenko as he then would likely be criminally charged and the Party of Regions would lose this year’s elections. Although Ukraine loses out from its frozen integration into the EU this is of less strategic importance to the Yanukovych administration than its maintaining a monopoly of power coupled with its ability to continue travelling, working and playing in the EU. Ukraine’s elites have long been integrated into Europe and do not care if they deny this possibility to their Ukrainian citizens. During the next few years, the Ukraine economy will be pushed to its limits. Currently, the Ukraine desperately needs 30 billion in loans to survive, and with ousted former president Viktor Yanukovich having already pulled the country out from the European Union, and the new government wanting nothing to do with Russia, the government will be in dire straits. The US State department has issued a travel warning urging Americans not to travel to the Ukraine. Tourism is a huge part of Ukraine economy. with hotels, airlines and restaurants depending on tourism. As these businesses cut back, the ripple effect in cities like Kiev, Odessa and Yalta will have devastating consequences on the economy. Just as when the housing market died in the US, the effects were felt world wide. Not only will Ukraine's economy continue to decline, but most of Western Europe's fragile economy will also feel the effects. One industry that seems to thrive on the situation is the foreign bride market, A Foreign Affair operates four office in the Ukraine. Kenneth Agee the marketing director says, "In the last few weeks we have seen the biggest surge ever on women signing up. Not only have we seen the biggest surge, but we have seen the highest quality of women signing up; doctors, engineers, even some of Ukraine's most beautiful models, With the possibility of war looming over the horizon, American men are looking very desirable." A Foreign Affair 's new member Irina of Kiev says, "America is stable, American men have very good family values. These are important to Ukraine women; we want a good environment to raise our families. With Russian tanks rolling down our streets, I do not see a bright future here for starting a family. The future does not look good for the Ukraine. Russia has no intention of letting Ukraine have complete independence. Most western Ukrainians have had a strong dislike for Russia for many generations, and will do what ever it takes to resist Russian influence or occupation. This being said, the country will have a long battle and many lines drawn in the sand, from serious economic sanctions to full out war. At this time, it looks like this struggle could go on for a decade or more.